Any way to work on two images side by side? Almost every day I work on images that are part of a set. Frequently I need to have identical crops/positioning/composition on similar subjects and/or similar environments. If I could have the images side by side instead of in separate tabs it would be really great for getting my work done quickly. Is anything along these lines possible in Photo? Basically two documents being edited in one workspace, with the software only acting on the document that is selected. A split screen for two tabs if you will. Drag the document tabs from the top of the work area to the middle of the interface to detach them. Not the exact functionality I was looking for, as positioning the image just right causes the window to snap back into place, but I can make do when needed. Thanks for the tip. Try as I may it does not work for me. I click on the image's title and drag but nothing happens. Latest 1.6 version in use. The above reply only applies to Windows. On Mac go to menu Window ▸ Separated Mode to be able to have/use documents on its own document window. But now I can see the cluttered desktop behind all the panes. That's rather distracting. On Macs, a workaround for that is to use the Spaces feature to create a new desktop 'space' & give it a plain solid color background. Funny old world... but now trying the beta and it is handling the raw files from Olympus micr-4/3 better than 1.6. But how odd it seems that I cropped to the preset 8in square in raw developer - of course moving the box to suit. But when in the photo persona I checked image size and found it was 9.25in square. As ever, I guess I have done something wrong? It's hard to say without seeing some screenshots, or maybe the files in question. Could be something you did, or a Photo bug. (By the way, if you're now working in the beta, the discussion may be more appropriate for one of the Affinity Photo Beta forums (Mac or Windows, as appropriate). Thanks Walt - I agree! I have that wish too. I click on -> Window -> All Solve and actually get two pictures side by side. Now I want to clone from one photo to the other, but that does not work. Not in AP 1.6.5. and not in 1.7.0.231 (Beta). How can I do that? Diesen Wunsch habe ich ebenfalls. Ich klicke auf --> Fenster --> Alle Lösen und bekomme tatsächlich zwei Bilder nebeneinander. Nun möchte ich von einem Foto auf das andere klonen, was aber nicht geht. Nicht in AP 1.6.5. und auch nicht in 1.7.0.231 (Beta). Wie schaffe ich das? Now I want to clone from one photo to the other, but that does not work. Not in AP 1.6.5. and not in 1.7.0.231 (Beta). How can I do that? You need to enable a global source. It's explained in the Affinity Photo Help (Cloning and Healing topic) and in the Global Cloning video tutorial. I already knew these videos. But if I have not overlooked anything, cloning will only be shown in one picture. But I want to clone from one to another picture. And I want to see both images side by side or overlapping so I can switch back and forth. Is that possible? Diese Videos habe ich schon gekannt. Soferne ich aber nichts übersehen habe, wird dort das Klonen jeweils nur auf einem Bild gezeigt. Ich möchte aber von einem auf ein anderes Bild klonen. Und dabei möchte ich beide Bilder nebeneinander oder überlappend sehen, damit ich hin- und herswitchen kann. Ist das möglich? You can show both images side by side using Separated mode on Mac or floated windows on Windows. You can clone from one to the other by setting one as a global source, and using the Clone Tool in the other, as shown in those videos. So, if those don't satisfy your need, I guess I don't understand your problem. Sorry. I try to represent my desire with the following pictures. 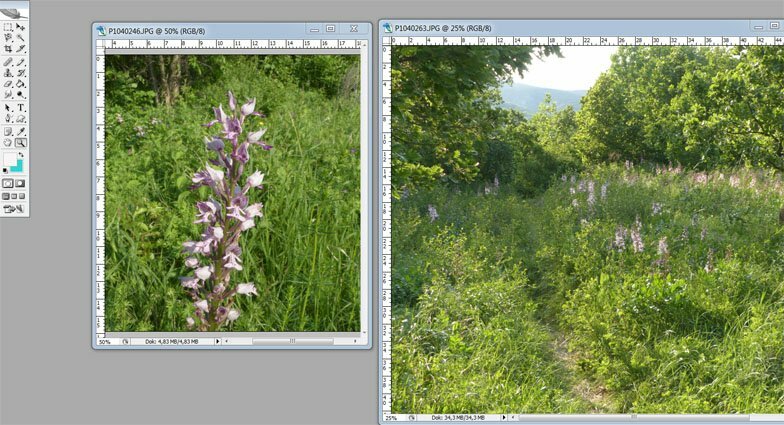 The first picture shows a flower meadow on the right, which has a bottom left area with no flowers. From the second picture I have a suitable flower (could be another subject) that I can copy in with clones. That's what I want from AP. Ich versuche meinen Wunsch mit den nachfolgenden Bildern darzustellen. Das erste Bild zeigt rechts eine Blumenwiese, die links unten eine Fläche mit keinen Blüten hat. Von zweiten Bild habe ich eine passende Blume (könnte auch ein anderer Gegenstand sein), die ich mit Klonen einkopieren kann. So etwas wünsche ich mir von AP. 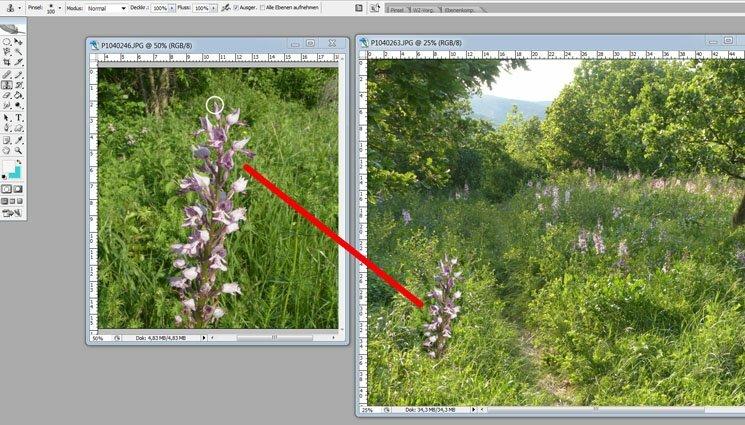 clone it onto a new pixel layer in its original size, then scale/transform the new pixel layer so the flower is the right size. And actually, you don't need to float the two images side by side. To follow the second approach that I mentioned, you have them both open. You add the left image as a global source using the Sources studio panel. You then select the the second image, add a pixel layer, and select the clone tool. On the context menu you choose Source: Global. You then double click the clone tool on the layer in the Sources panel, and Alt-Click on the spot you want to clone from on the image that pops up. You then proceed to paint with the clone tool to place the flower in the second image. When you have all of it, you click on the Move tool, and then you can drag on a corner node of the layer's bounding box to scale the cloned image to the size it needs to be. And you're done.